The View-Master is back. Now it's virtual reality for kids. This fall, Google (GOOG) and Mattel (MAT) are coming out with a plastic viewer that pairs up with your smartphone. You can explore virtual reality environments, make three-dimensional dinosaurs appear in the real world or -- in classic fashion -- transport yourself to faraway places and historical monuments. Unlike the old View-Master's static images, you can spin around in place and see everything around you. It'll work with every smartphone and cost $30, the companies said. They unveiled it in New York City on Friday. 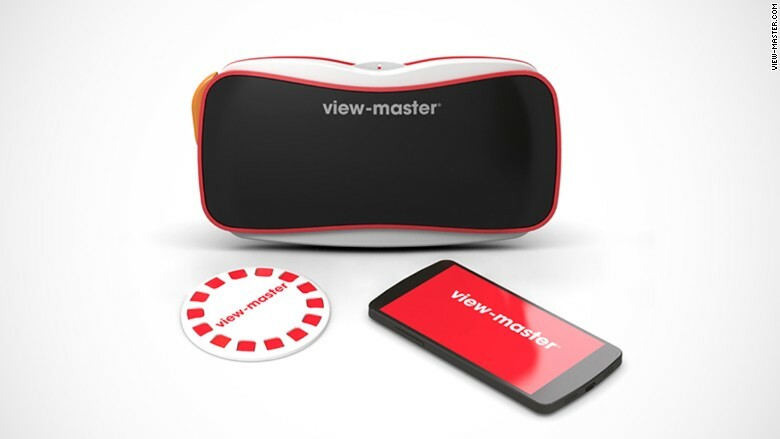 The new View-Master is basically a polished version of Google Cardboard. 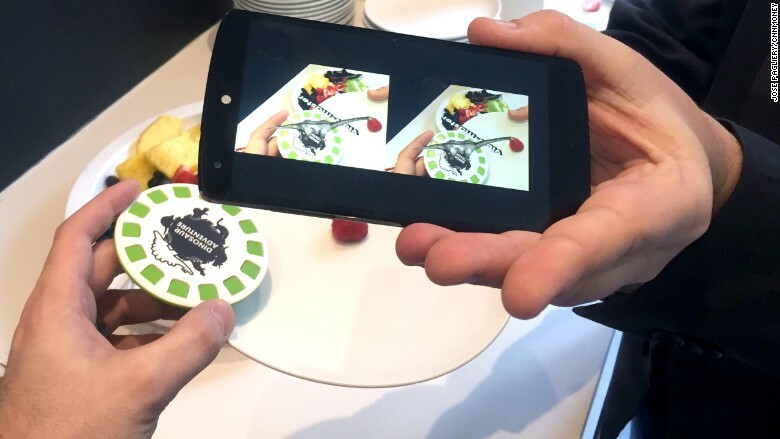 A downloadable app does all the magic, splitting your phone screen into two images that, when viewed together, create the 3-D effect. The viewer is just a comfortable way to hold the phone up to your eyes. A magnetic button on the side lets you cycle through images or interact with your environment. You can click on an item and learn more about it. Mattel is also dusting off old stereoscopic images from its vast library, so you can see the Golden Gate bridge today -- and back when it was just constructed in the 1940s. I tried out an early version of the product and traveled to San Francisco, the surface of the Moon, and I had a 3-D dinosaur sit on the palm of my hand and dunk its head into a raspberry. Mattel is on a mission to keep its product line relevant to today's technological world, so expect brands like Barbie, Hot Wheels, and Thomas to get digital treatment too someday. Mattel executives wouldn't say what's next, but a fully explorable Barbie house and the experience of driving inside a blazing orange Hot Wheels race track are a natural fit, they said. Mattel isn't totally ditching the classic View-Master product design, though. The old version relied on thin, cardboard disks called "reels" that featured pairs of stereoscopic images on transparent film. In this new model, disks still carry content. But you don't slip them into the viewer. Instead, you point your viewer at them, scan a unique design (like a QR code), and 3-D images pop up. Select the floating images, and the software in the phone transports you to wherever you're going. Mattel expects to sell the disks in $15 packs of four. Mattel brand executive Douglas Wadleigh said the company is betting on nostalgia and an appetite for collectibles. But the device can work without reels and rely solely on app stores online. Like its predecessor -- which was popular with children in the 1960s, 70s and 80s -- this View-Master is geared toward family use. Small adjusters inside the device will fit any parent's smartphone. And the app is meant to be used without full Internet access. But is it healthy for children to stare at virtual reality screens two inches from their eyeballs? Mattel said the product has received approval from a team of pediatric ophthalmologists at St. Louis University. And the toy is recommended for children ages seven and older. Besides, this View-Master isn't meant to be used very long anyway. "We made it without a strap. 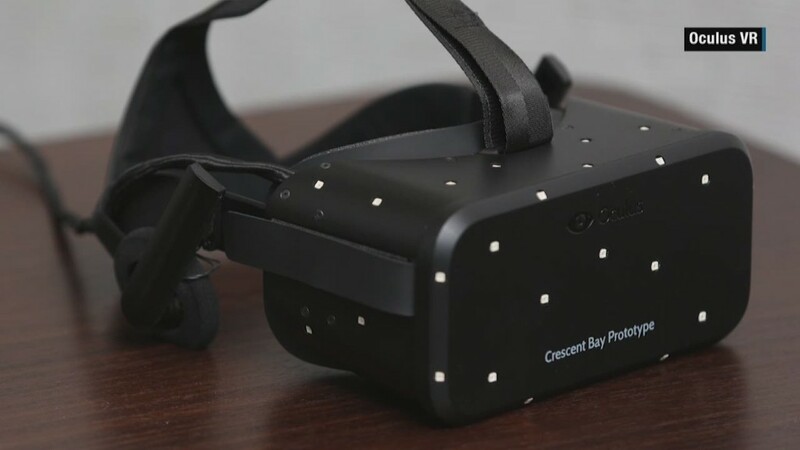 We don't expect them to zone out for hours on end," said Mike Jazayeri, Google Cardboard's product director.